These attractive acrylic table displays will ensure that your products look their best at all times. The clear acrylic design gives a nice contrast the the items on display and does not distract the customers attention. These tables can fit in with any current design aesthetic. 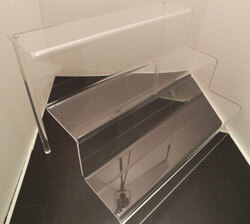 The high quality acrylic materials used in the construction of these acrylic tables ensure optimal durability.